Give a girl the right shoes and she can conquer the world - I think Marilyn Monroe was on to something. Empowered with the right knowledge, access and community we can pretty much do anything. This was never more clear to me than on Saturday 4th August at the first #JSESheInvests event at the Joburg Stock Exchange. There we were… a delightful mix of women of different ages, colours and levels of investment experience, who had come together from all parts of the country to learn more about our money and how to take the first or next step towards financial freedom. I felt really proud to be part of the line up of strong, smart, inspirational speakers who are helping empower South African women to invest. 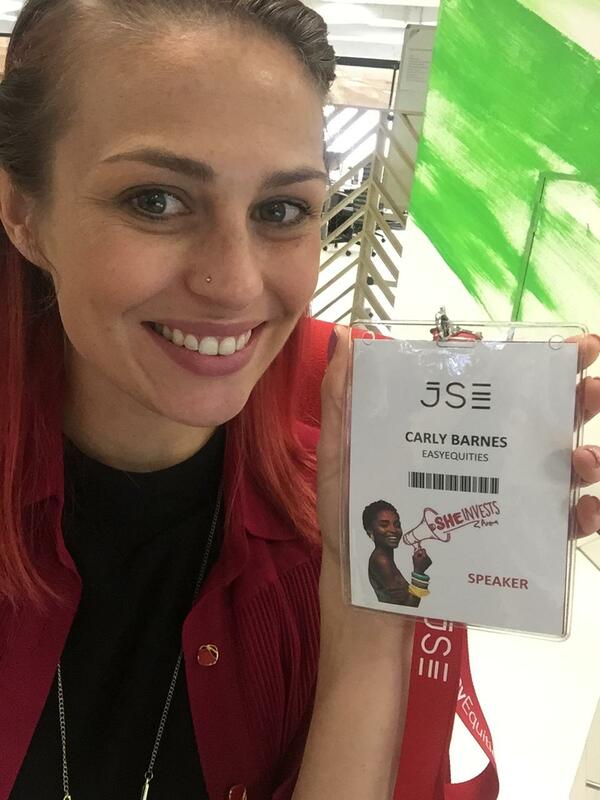 Not having come from a financial background whatsoever, I shared a bit about my journey with EasyEquities and how it has shaped and changed my perspective on life, values and well… shoes! In the last 2 years I’ve gone from being @ShoeGalCarly to @ShareGalCarly, in a way that goes far beyond the Twittersphere. I’m pleased to see, based on my Twitter poll, that many of you already know shares are a much better place to invest your money than shoes. But to be honest, I think you can have both. Life is about balance, and a girl needs the spoils too. If you look at what a pair of Louis Vuitton black stillettos will cost you, and what value they keep over 10 years vs what the same amount of money would be worth in Louis Vuitton shares over the same period of time, it might help you be smarter about how you steer your spend descisions. The R11 600 you would have spent on shoes, is now worth around R85 000 in shares. Risk. It’s not our thing – for a lot of people, but our data says even more so for women. I’m not saying that being conscious of risk is a bad thing, but there are ways to manage risk without letting it hold you back from slaying the markets. For a start there are these amazing things called Exchange Traded Funds that help you diversify your risk. Women know all about diversification. I don’t know any woman with just one pair of shoes. We need the winter boots, a pair of strappy sandals, a few trusted pairs of pumps for all the running around we do, sneakers for the fitness and brogues for work. Imagine being able to invest in all of those things which give you different benefits at different times, in one go. That’s kind of what investing in an ETF is like; it lowers your risk by giving you exposure to lots of different companies that you invest in as one thing. I’ve never been to Barneys, but I dream of it. A megastore full of designer heels – delish. Luckily I am in the Barneys of shares right now. We have more access today than what we ever did. We can invest in a locally listed luxury goods company like Richemont, which has brands like Chloe and Cartier under its umbrella, for as little as R50 – and still reap all the benefits it offers in terms of company growth. Do yourself a favour and take a look at how Richemont’s share has performed over the last few years. And if you’re looking to play it slightly safer, you can invest in an ETF that contains Richemont – like the Satrix Indi and the CoreShares Top 50. Or you can set your sights even further and invest in companies like Nike, or Under Armour which are listed in the US but available to invest in with whatever amount you have, on EasyEquities. Here’s the thing. Forming a new habit, like breaking in a new pair of shoes, takes time and doesn’t come without the odd blister. But then one day you’re strutting yourself around in 6 inch heels and it feels easy. You don’t get there, if you don’t take the first step. My team and I are always here to help you do that – you can reach out to us on Twitter, Instagram or Facebook if you need any guidance with getting started. Happy Women’s Month you beauties!